T24 reported: A Diyarbakır court ordered blocking measures for 120 twitter accounts including those belong to media institutions daily Evrensel, Dicle News Agency (DİHA), Fırat News Agency (ANF), BestaNuce, daily Özgür Gündem and WelatNews. Evrensel ve DİHA’nın da aralarında olduğu 120 Twitter hesabına erişim engeli! Pro-Kurdish IMC TV, one of the few television channels remaining critical of Turkey’s government, is banned from TÜRKSAT satellite by a prosecution order regarding a terrorism investigation. IMC TV remains on air on the Internet stream and a new satellite. 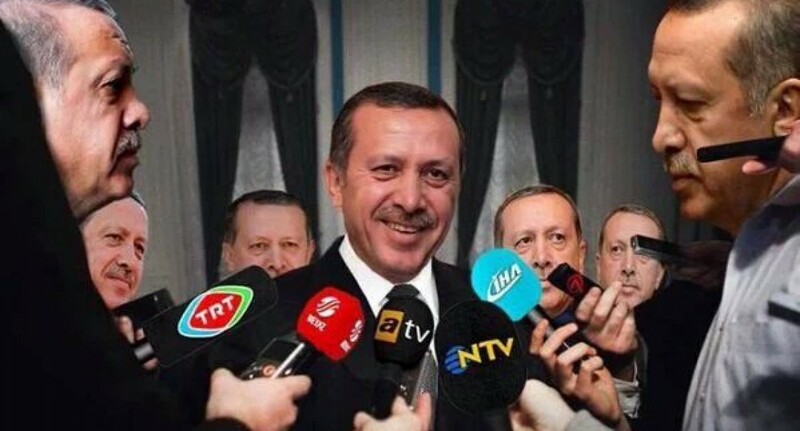 Similarly, presidential aide Yusuf Yerkel have had blocked several news stories and other content by court order. Yerkel became internationally famous by kicking a miner in front of cameras following the mining disaster in Soma in 2014. Mashable reported: “Famous images showing an aide to Turkey’s prime minister kicking a protester in the wake of a national tragedy are slowly vanishing from the internet in Turkey.” An aide to Turkey’s president kicked a protester. Then photos of the assault started disappearing. The recent Sultanahmet bombing news ban was discussed a lot but it is one of the many, actually hundreds, in recent years. Deputy Prime Minister Bülent Arınç has answered the parliamentary question of CHP Deputy Leader Sezgin Tanrıkulu on July 2014 and said the courts ordered a total of 149 news bans as of 4 in 2010, 36 in 2011, 43 in 2012, 42 in 2013 and 24 in the first six months of 2014. The news bans continued in accelerating pace since then. According to this tweet from online rights activist Yaman Akdeniz, 223 links from 146 media organs were blocked regarding the Sultanahmet bombing news ban. Akdeniz also shared the document from the Prime Minister’s office to the court, demanding the ban, in this tweet. Interview with Brazilian caricaturist Carlos Latuff, who is banned in Turkey: Why did Turkey ban a Brazilian cartoonist? Bianet reported: “DİHA website that is blocked as of July 25 has been censored 28th time.” 28th Access Block against DİHA Political news website siyasihaber.org also announced with this tweet that their website is blocked by TİB and they have a new address. It is their first time. According to this tweet featuring the court document from İnternet freedom activist Yaman Akdeniz, TİB blocked 8 other sites alongside siyasihaber.org and 10 twitter accounts. Social media accounts of Kurdish journalists and news sources have been systematically banned by TİB throughout the year. Harassing of Kurdish journalists continued as: “DİHA reporter, Merdan Berk, following up protests in Diyarbakır has been wounded in both of his legs.” DİHA Reporter Merdan Berk Injured in Both Legs & “[JİNHA] reporter Duygu Erol went to the street of Gazi where the curfew was lifted last week but still the siege of police continues,in order to cover the news. Police stoped and threatened her by using the sentences; ‘We’ll send you to the cemetery. if it was up to me, I would execute you. '” Police threaten our reporter! & Kurdsat News cameraman Baran Ok was detained on duty in Diyarbakır on December 31 and not released until January 4. In this video, his colleague is captured trying to convince the police to release Ok, saying “O benim Kameramanım” (He is my cameraman” which ended up as a hashtag on twitter for the demand of the journalist’s release.